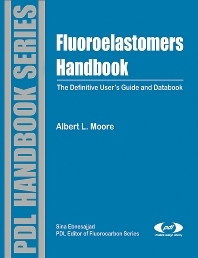 Fluoroelastomers Handbook: The Definitive User's Guide and Databook is a comprehensive reference on fluoroelastomer chemistry, processing technology, and applications. This is a must-have reference for materials scientists and engineers in the automotive, aerospace, chemical, chemical process, and power generation industries. Fluoroelastomers meet rigorous performance requirements in harsh environments, enhancing reliability, safety, and environmental friendliness. Fluoroelastomers are growing as products of choice for critical components such as O-rings, hoses, and seals in hostile fluid and temperature conditions. Elastomers engineers, formulators, parts fabricators, materials scientists, polymer chemists, chemical engineers, and plastics engineers in industry (automotive, aerospace, chemical, chemical process, and power).